It's been a fairly quiet blogging year probably because it has been a tumultuously surprising working year. At the beginning of February, we received the startling news that our university administration had decided to give our campus away to another university thus forming a new regional university. After the initial shock, it's been a year of negotiation and meetings, moments of frustration and despair and lots of fresh new challenges as well as exciting opportunities. So when we threw open our doors for Open Day for prospective students this year we still didn't have an official name for the new university. The marketing slogan was 'We're growing a new university to help you grow" branded with both university logos and the accompanying advertisements showed a growing tree. This imagery of leaves and trees has reappeared in subsequent marketing campaigns. 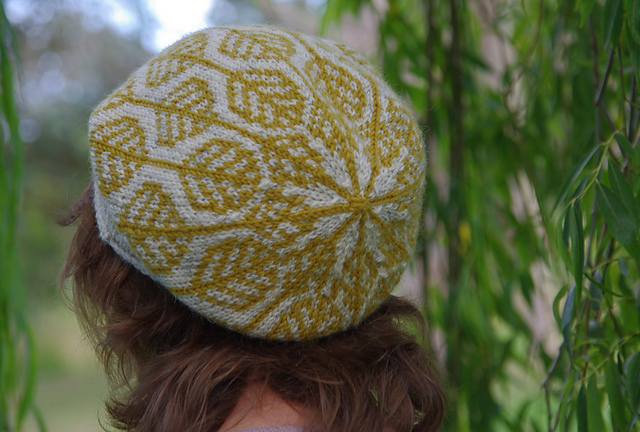 When I first saw this hat pattern the colourwork leaves reminded me of this. Our new University now has a name: Federation University Australia. 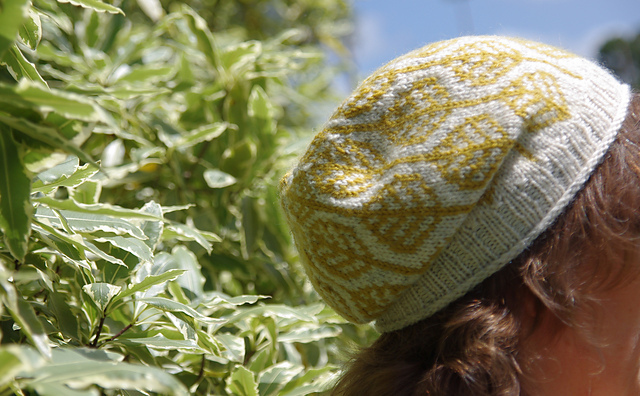 And so I give you the only hat I've made for myself this year: Federation. Knitting is my meditation; my escape from stressful times. 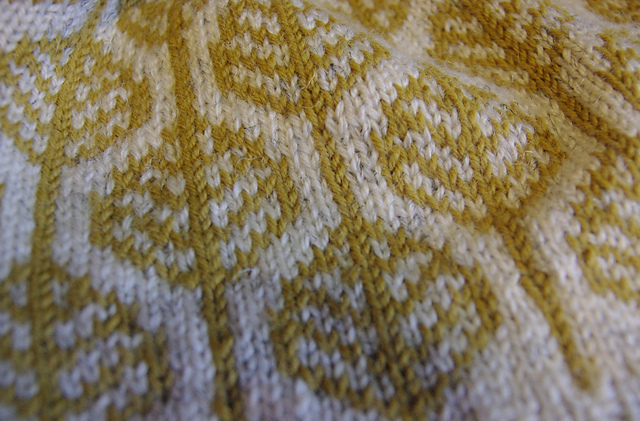 The soothing clink of needles and yarn creating things makes tensions and annoyances unwind into the growing object. So for me, particularly this year, certain objects evoke memories of places, times and situations. But rather than these being unhappy memories, the knitted garment becomes almost like a pair of rose-coloured glasses letting me see the events with distance, perspective and insight. Knitted garments are warm and fuzzy objects in more ways than one. (I'm being particularly weirdly philosophical tonight). So this hat symbolizes the end of the journey and a new beginning. 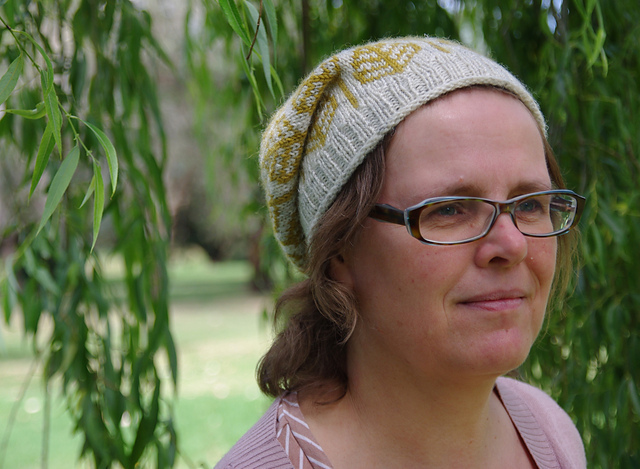 I chiefly knitted this hat over two days of train journeys, up and back to Melbourne for planning meetings for the new year with my new colleagues. I knit on trains - a lot. It makes a 2 hour journey to Melbourne productive and I can still talk to people. This year, I made a psychological major leap forward and bought my knitting out of the closet so to speak and will now knit on journeys in front of my work colleagues. The guys I work with found the fact that I knit colour-work on four needles in the round whilst having an academic conversation fascinating. (The next secret ambition is to work out a way I can feel comfortable dragging out the knitting at meetings). 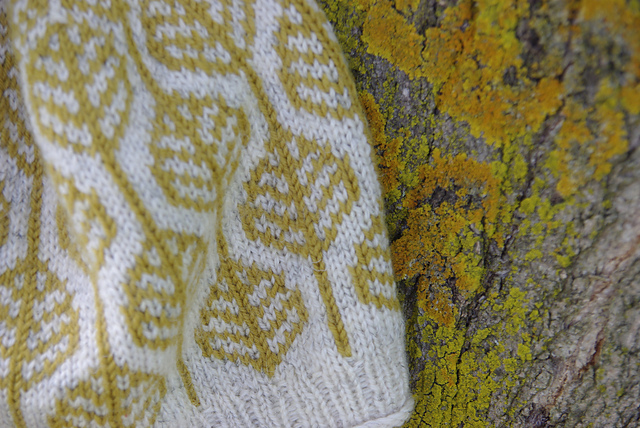 Yarn: For the leaves: Moda Vera Pure Wool 8 ply yellow green. For the background: upcycled 8 ply (DK) op shop wool, alpaca and, I suspect angora, blend in winter white/cream with small gray and black fibres. Thanks to the boy for his expert photography skills. He always manages to make me (and the knitting) look good somehow. Hooray for coming out of the knitting closet. It's hard for a woman, sometimes, to be open about doing traditionally woman'ish things, with not fear of this affecting the perception of one's colleagues. Well done.